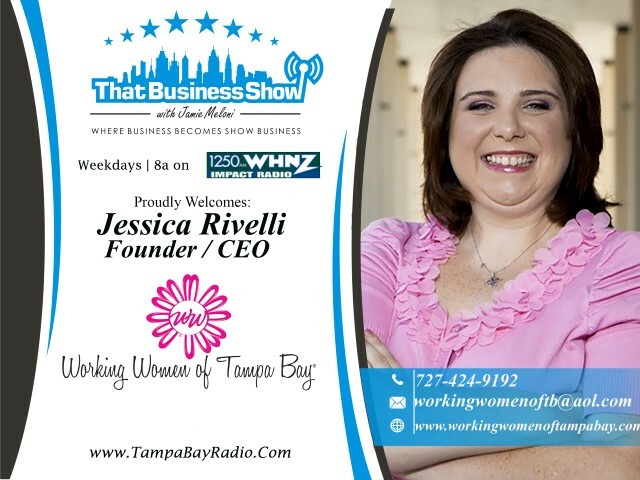 #ThatBusinessShow this morning aired our weekly #WorkingWomenWednesdays feature brought to you by the influential and always connected Tampa Bay based Working Women of Tampa Bay Networking Group and their Founder/CEO Jessica Rivelli. Learn more about all their events and ways to get involved at http://www.workingwomenoftampabay.com! Jessica opened up the show with an update on the speaker panel that will be appearing at the annual Working Women State Conference which is being held at the Straz Center on September 10th and 11th of this year. One of the featured speakers is Laura Vanderkam, author of the book I Know How She Does It: How Successful Women Make the Most of Their Time as well as What the Most Successful People Do Before Breakfast. More information about her and the event can be found at http://www.workingwomenconference.com and tickets are on sale now on the site! 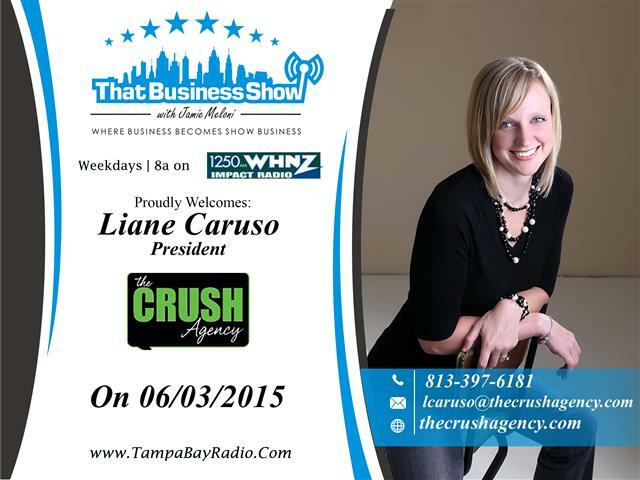 My 2nd guest on the program was Liane Caruso, President of The Crush Agency. The Crush Agency works with businesses on a wide variety of marketing needs from social media to branding and public relations and much more. The segment focused on Liane’s expertise in the field of SEO/SEM campaigns and she shares some great information on the importance of transcribing your videos on YouTube for enhanced SEO (Search Engine Optimization) performance because Google cannot read what you say on the videos as well as the importance of having a blog to build your online presence. Liane launched Limelight Marketing Consultants in 2009 and then grew it to a successful company that was then able to merge with The Crush Agency where she brings her now 20 years of marketing knowledge to the company as their President. Liane is available for follow up via email at lcaruso@thecrushagency.com or phone at 813-397-6181 and learn more about the company at http://www.thecrushagency.com! 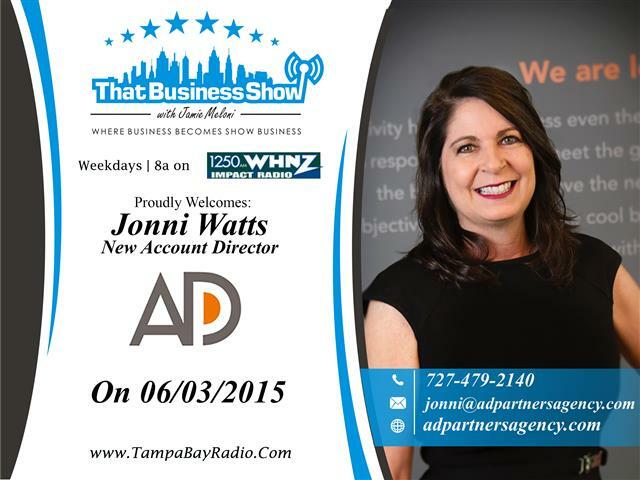 On the 2nd half of the show, I was joined in studio by Jonni Watts, New Accounts Director with Ad Partners, a full service ad agency based in Tampa. Best known for putting Attorneys Culpepper and Kurland on the map in Tampa, Jonni now leads the agency’s new business initiative. Ad Parnters is a results-oriented full-service ad agency with many clients in cluding Amscot, Beef O’Brady’s and Freedom Health as well as many more. We discussed the 3 components to an effective advertising campaign on this segment starting with creating compelling and creative advertising that gets you noticed, something she did very well with on the Culpepper Kurland ads; secondly ensuring proper placement of the ads whether it be billboards, television, radio or other outlets; and finally tracking results. Ad Partners has a great tracking strategy for their ad programs and we discussed that on the segment as well. Available for a free consultation to discuss your needs, Jonni can be reached at 727-479-2140 or email at jonni@adpartnersagency.com and learn more at http://www.adpartnersagency.com!